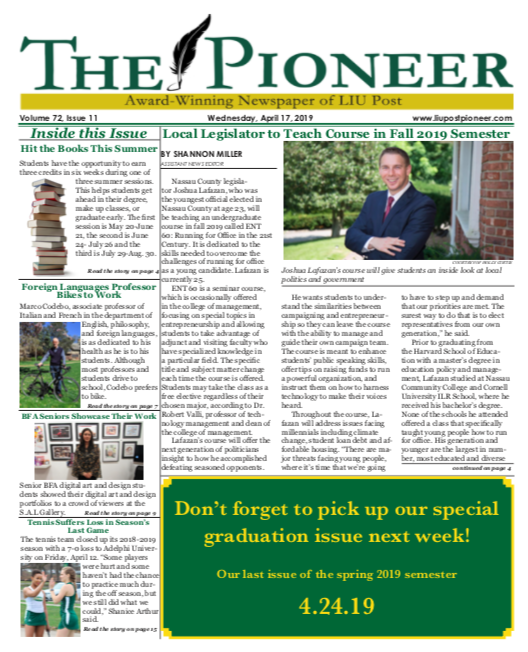 In order to keep the student body aware of occurrences on campus, the Pioneer compiles and publishes crime reports. The reports are public and are available to view at the Public Safety office. All names have been redacted for privacy purposes. At 3:45 p.m., Public Safety received a call reporting an issue with a resident in Kings Hall. When a Public Safety officer arrived, a complainant explained that a resident student had forced the ground window open to gain access to his room. Public Safety spoke to the resident, who stated that he was no longer going to attend LIU, he was going to another school and was moving all of his belongings out. The student was accompanied by his mother. The student and mother left campus, and the room was re-secured. Two sexual assaults were reported anonymously. Both incidents were reported to have taken place at the Kahn and Pratt parking lots, both between Oct. 15 and Nov. 15, 2018. The reports were forwarded to judicial referral. A larceny was reported on Jan. 18. The incident was reported to have taken place on Dec. 21, 2018 at 2:59 p.m. in Hillwood Commons. The investigation is pending. At 6:50 a.m., a vehicle heading south on Gold Coast Road tried to turn into the Pratt/Gold parking lot. Icy road conditions caused the vehicle to slide onto the curb, causing a collision with the stop sign. The vehicle sustained damage to the front driver side. At 6:02 p.m., a fire alarm sounded from a room in Brookville Hall. Upon arrival, a public safety officer discovered that the window in the room had been left open and a water pipe in the heater unit had frozen and cracked. The resident of the room was not present and had not yet checked in for the semester. The facilities department and office of campus life were notified. Two rooms located on the first floor underneath the room had water leaking from the ceiling. The first room was unoccupied; the occupant of the second room reported that they had no property damage. The residents were asked by their RA to keep their windows closed. At 5:13 p.m., Pell Hall nursing department staff reported to Public Safety that they found water damage to the ceiling tiles in Pell Hall Room 125. Investigation revealed that the water damage was caused by a leak on the floor above from an air conditioning unit located in a mechanical room across from Room 226. The facilities department was notified for repair and cleanup. Public Safety was made aware of a robbery of a resident student on Monday, Feb. 4 at approximately 1:30 a.m. in Brookville Hall. There was no weapon displayed and the victim was not injured. The investigation of this crime is ongoing.